Some herbs have unique botanical compounds that can assist with balancing hormone levels, making them potentially useful for women with PMS, menopause symptoms, or other forms of hormonal imbalance. Please take your time to carefully read the following article, in which you will find important information about the most used herbs for balancing hormone levels. There are two types of herbs for balancing hormone levels: phytoestrogenic and hormone-regulating herbs. The first one contains phytohormones, and the second stimulates the natural production of hormones in the body. Phytoestrogenic herbs are all edible plants that contain a botanical compounds that are very similar to human estrogen, though these compounds tend to be somewhat weaker. Not all phytoestrogenic herbs contain the same compounds, but all of their active compounds have some structural similarity to estrogen that allows them to act like estrogen in the body. Phytoestrogens are found in almost all the edible plants, but only a few of them have enough phytoestrogens to produce noticeable effects in the human body. Many of these plants have a history of traditional applications, such as the herb black cohosh, which has been used by Native American peoples to ease ailments related to the female reproductive system. Many symptoms of hormonal imbalance - like irregular periods, vaginal dryness, and hot flashes - appear when the female body is not able to produce sufficient estrogen. 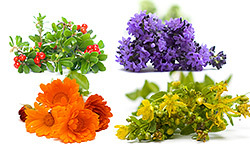 What phytoestrogenic herbs do is provide the body with estrogen. In other words, these herbs replace the natural hormones the body produces with phytoestrogens. Phytoestrogenic herbs are generally proposed as an alternative to hormone replacement therapy (HRT) because both of them work in a very similar way: raising the low levels of estrogen in the body. Phytoestrogenic herbs are very effective for treating menopause symptoms, and they are reasonably priced compared to HRT. However, phytoestrogenic herbs have recently been questioned because they add outside hormones to the body. Because of this, they can raise the risk of developing breast cancer and blood clots. Nonetheless, there are other alternative herbs that are as effective as phytoestrogenic herbs, but don't have side effects. In particular, hormone-regulating herbs are a great alternative for treating hormonal imbalance. Hormone-regulating herbs are plants that don't contain any compounds similar to estrogen. In fact, there are plenty of these plants, but only a few of them have the specific nutrients that help nourish the endocrine system and consequently balance hormonal levels. How do hormone-regulating herbs work? These herbs nourish the endocrine system, or the system of hormonal glands. This support helps the glands produce and secrete hormones at balanced levels, thus remedying not just low estrogen levels, but also many different forms of hormonal imbalance. Hormone-regulating herbs can be seen as a safer and healthier alternative to HRT because these herbs do not add hormones, and they produce little to no side effects. 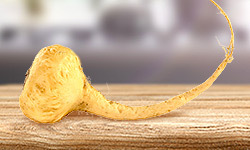 Macafem is an excellent hormone-regulating herb that is rich in both essential nutrients and unique alkaloids that nourish the endocrine system. It has been used in its native Andean mountains since Incan times or even before, and its use to balance hormone levels is backed by many doctors today. 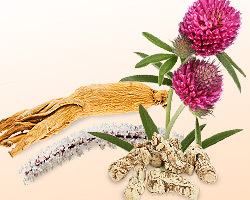 We recommend this herb for treating hormonal imbalance because of its amazing ability to support the hormonal glands. Please visit the following webpage to read more about Macafem.